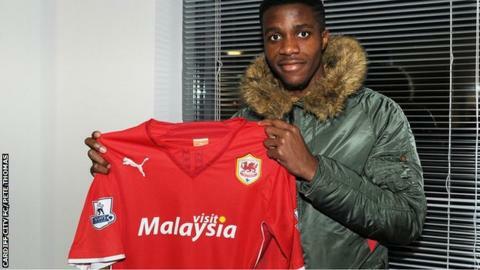 Cardiff City have completed the signing of Manchester United winger Wilfried Zaha on loan until the end of the season. Zaha, 21, is Cardiff's fifth signing of the January transfer window. The England international has already been training with the Bluebirds ahead of Saturday's home game against Norwich. Zaha's United team-mate Fabio Da Silva has also signed for Ole Gunnar Solskjaer's side in a permanent deal. He has also won two caps for England, but is yet to score an international goal. "Probably we are done with signings, but there may be players going out on loan and some transfers as well," said Solskjaer. Cardiff sit bottom of the Premier League with 18 points, three points from safety. On Saturday, they face Norwich, who are six points ahead of them in 12th, before travelling to Swansea City in the second South Wales derby of this league campaign. Solskjaer, who took over following Malky Mackay's sacking in December, has been keen to assert his influence on the side. Under his leadership, the Bluebirds have lost three league matches - to West Ham, Manchester City and Manchester United - but won FA Cup ties against Newcastle United and Bolton. Solskjaer has been given funds by Cardiff's controversial owner Vincent Tan to bring in Norwegian trio Magnus Wolff Eikrem, Mats Moller Daehli and Jo Inge Berget as well as Stoke City striker Kenwyne Jones. Zaha joined United from Crystal Palace for £15m in January 2013, but stayed at Selhurst Park on loan until the summer. Since his move to Old Trafford, Zaha, signed when Sir Alex Ferguson was in charge, has started just two games, the Community Shield victory over Wigan and the League Cup fourth-round win against Norwich. His only league appearances under David Moyes have come as a substitute against Newcastle and Aston Villa in December.